Hat Tip: Duane Patterson aka Hugh Hewitt's producer aka @radioblogger aka Generalissimo aka big Duane who told the story and played the audio clip of the song "Rosie The Riveter" on his Aftershow that runs Monday thru Friday at 7:00 CT on the Hughniverse. 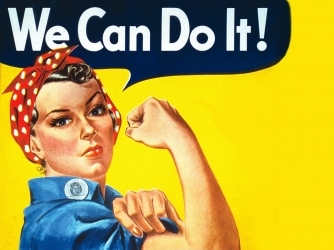 "Unsung for seven decades, the real Rosie the Riveter was a California waitress named Naomi Parker Fraley. Over the years, a welter of American women have been identified as the model for Rosie, the war worker of 1940s popular culture who became a feminist touchstone in the late 20th century. Quoting from the New York Times, "A 1942 photograph of Naomi Parker Fraley that was the likely inspiration for the Rosie The Riveter poster." Click here for the full story in the NY Times. Here is the song, that Duane Patterson played on his Aftershow, about Rosie The Riveter on You Tube sung by The Four Vagabonds. "The song was written by Redd Evans and John Jacob Loeb"
God Bless, Naomi Parker Fraley! May this American icon Rest in Peace!